Todd spent his formative years growing up in Mundelein, Illinois on a farm that has been in his family for over 5 generations. He became interested in music at an early age and quickly excelled at playing the trumpet. In fact, in 1981 during high school Todd was named Whos Who in music for his merit and accomplished as a music student. 1976, at the age of 12, Todd began his career working in his family business. The company, Sound of Music, Ltd, provided satellite communication services to businesses across the country. Todd worked his way to VP of Sales and Marketing and played a key role in generating over $1.1 million in EBITDA for the company. The company customer base was sold to Muzak Corporation twenty two years later for over 8X enterprise value of EBITDA. Todd was directly involved in Muzak’s acquisition of this successful family business. Through that experience, Todd gained an interest in the brokerage industry and it was then that EBIT Associates, Ltd. was formed. Todd is an entertaining and sought after public speaker, giving presentations and seminars on the benefits of having advisory representation when it comes time to buy or sell a business. He has also written several articles on the importance of advisory representation. Todd is a Candidate for an Associates Degree from Trinity University of Deerfield Illinois for finance and Biblical studies. He is the principal and founder of EBIT Associates, Ltd., a Barrington, Illinois. Todd has bought and sold companies personally over the years and serves on three company boards. He is the past 2007 President of Midwest Business Brokers and Intermediaries (MBBI), a not-for-profit organization. Once when asked by his eighth grade teacher what he wanted to be when he grew up. Todd’s response was, “I want to be a pilot.” In fact, he is an instrument rated pilot today. In harmony with his drive for success in business Todd exemplifies integrity and compassion in all that he does. When he isn’t working you will likely find him skiing or scuba diving or volunteering at an orphanage in Baja Mexico where his sponsored children know him as “To” or Uncle Todd. He enjoys golfing, and has been married over 16 years. Todd and his wife serve together at their church as premarital mentors and reside in Wadsworth Illinois. Licensed by Illinois Business Brokers Act of 1995 Illinois Securities Department. Guest Speaker for many organizations. Todd Cushing is on the board of three companies plus one non-profit organization. EBIT Associates is a leading intermediary and investment banking firm advising private and corporate clients on lower middle market transactions. EBIT provides sophisticated solutions in merger and acquisitions, private placement, financial restructuring, fold-ins, IPO’s, project consulting and valuation opinions. We use a customized marketing strategy and state-of-the-art resources, allowing us to close transactions over three times the industry average. In 1976, at the age of 12, Todd began his career working in his family business. The company, Sound of Music, Ltd, provided satellite communication services to businesses across the country. Todd worked his way to VP of Sales and Marketing and played a key role in generating over $1.1 million in EBITDA for the company. The company customer base was sold to Muzak Corporation twenty-two years later for over 8X enterprise value of EBITDA. Todd was directly involved in Muzak’s acquisition of this successful family business. Through that experience, Todd gained an interest in the brokerage industry and it was then that EBIT Associates, Ltd. was formed. Todd is an entertaining and sought-after public speaker, giving presentations and seminars on the benefits of having broker representation when it comes time to buy or sell a business. He has also written several articles on the importance of broker representation. 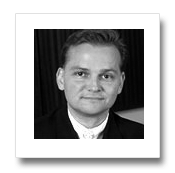 Todd is a Candidate for an Associate’s Degree from Trinity University of Deerfield Illinois for finance and Biblical studies. He is the principal and founder of EBIT Associates, Ltd., a Barrington, Illinois. 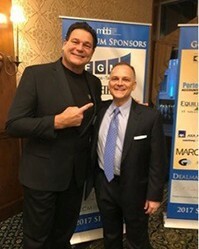 Dan Hampton and Todd Cushing, Principal of EBIT Associates, meet up at a conference in 2017. Dan was the keynote speaker talking about his career in football and his current passion for leadership. Dan owns a security company he partnered with back in 2002, which he bought from EBIT Associates. 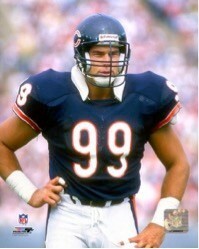 Dan Hampton also known as “Danimal” is a retired Hall of Fame American football defensive tackle who played twelve seasons for the Chicago Bears from 1979 to 1990 in the National Football League. 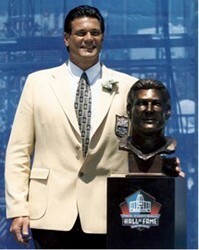 He was elected to the Pro Football Hall of Fame in 2002. Previously hosted pre- and post-game shows for the Bears on WGN Radio in Chicago. Todd has bought and sold companies personally over the years and serves on three company boards. He is the past 2007 President of Midwest Business Brokers and Intermediaries (MBBI), a not-for-profit organization. Todd is an instrument rated pilot, enjoys golfing, and has been married for over 12 years. Todd and his wife serve together at their church as premarital mentors and reside in Wadsworth Illinois. EBIT ASSOCIATES, LTD., Barrington, Illinois 1999 to present is a leading and intermediary and investment banking firm advising private and corporate clients on lower middle market transactions. EBIT provides sophisticated solutions in merger and acquisitions, private placement, financial restructuring, project consulting and valuation opinions. We use a customized marketing strategy and state-of-the-art resources, allowing us to close transactions over three times the industry average. Sold over 40 companies in the service, manufacturing, transportation, and distribution industries. Sought after speaker for the industry on topics such as buying a company, selling a company, and what to ask when qualifying a potential client. Past and present Board of Director of four companies and one not-for-profits. Past Board of Director of www.mbbi.org Midwest Business Brokers (MBBI) and Intermediaries from 2000-2009 and past President in 2007. Purchased service transportation business in 2001 with $1.6M in revenues and a staff of 45 individuals. Sold company in 2005. Received several designations in the M&A industry with hundreds of hours of class preparation. Designations include: CM&AA (Certified Merger & Acquisition Advisor), CMEA (Certified Machinery/Equipment Appraiser), SBA (Senior Business Analyst), FRC (Financial Recast Consultant), BTS (Business Transfer Systems), and CBB (Certified Business Broker). SOUND OF MUSIC, LTD., Mundelein, Illinois 1976 to 1999 Offers world class total communications support to major corporations and small businesses nationwide; includes full range of products and services maximizing audio and video capabilities through leading-edge satellite communications technology; former 3M Sound Products Dealer; recent affiliate of Muzak since April, 1998. Vice President, Sales and Marketing (1993 to 1999); Operations Manager (1987 to 1992); Sales Manager (1983 to 1987); promoted entry-level to Sales (1976 to 1982). Empowered with full P&L accountability for a diverse range of cross-functional responsibilities, including: sales, marketing, advertising, analysis of competition, customer service, budget administration, policy and procedures, building maintenance/operations, composing bids for local and national accounts, and updating computer system with current vendor pricing and labor rates. Direct administrative and sales staff of 18. Revamped and reorganized numerous operational protocols, which have significantly contributed to company’s stability and success.